Sporting some highly-imaginative secret pockets, our Mormon brethren have blazed a long and lonely trail in lunchbox lingerie. But now we all get a slice of the action with these What Would Jesus Do? 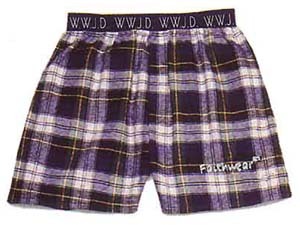 boxer shorts in 100 per cent cotton flannel  the sort of briefs St Michael could only have dreamed of. Boasting a "soft, comfortable fit" in rich Campbell Plaid tartan, the WWJD? legend is on an "extra-wide 1.5 inch fashionably-exposed plush elastic band." And there's some specially good news for the testosterone-driven young man  each pair has a "false fly." So, if WWJD? isn't reminder enough, access is denied in any case. All sizes available from small youth ($13) to adult extra large ($15).